Mat forming plant with square-section stems and oval, round toothed mid-green leaves. 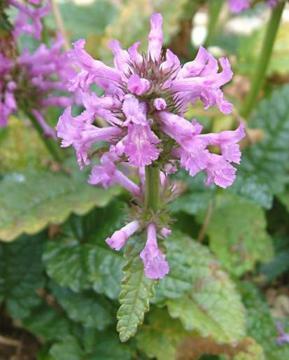 Whorls of hooded, tubular flowers on sturdy stems, purple pink or white in colour. Will grow in most reasonable soils. Tolerant of poor soil. Used as a medicinal herb since the Ancient Egyptians and regarded as having magical properties by the Anglo-Saxons.